Nuromedia GmbH is an independent multimedia and software engineering company founded in 2005 by experts of media industry, with profound expertise of international R&D, with offices in Cologne (Germany, head office) and Berlin . 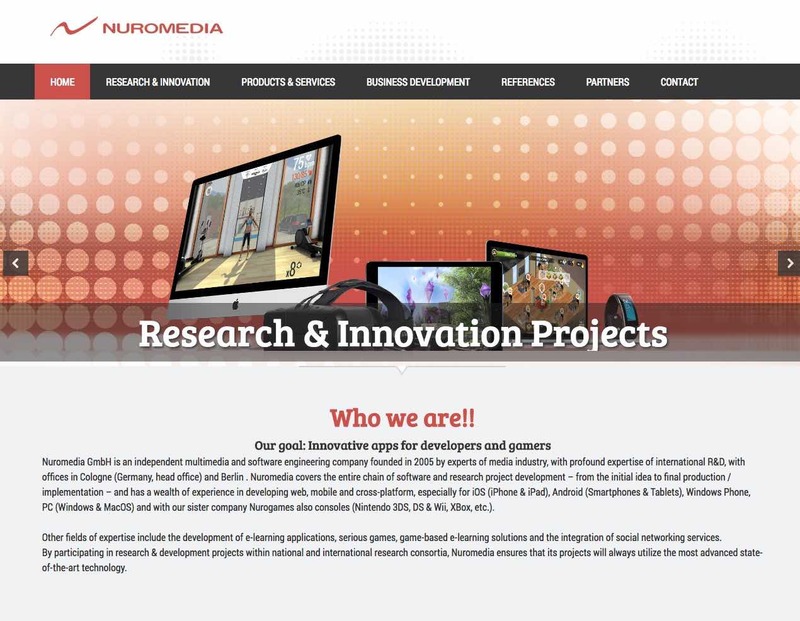 Nuromedia covers the entire chain of software and research project development – from the initial idea to final production / implementation – and has a wealth of experience in developing web, mobile and cross-platform, especially for iOS (iPhone & iPad), Android (Smartphones & Tablets), Windows Phone, PC (Windows & MacOS) and with our sister company Nurogames also consoles (Nintendo 3DS, DS & Wii, XBox, etc.). Other fields of expertise include the development of e-learning applications, serious games, game-based e-learning solutions and the integration of social networking services. By participating in research & development projects within national and international research consortia, Nuromedia ensures that its projects will always utilize the most advanced state-of-the-art technology.